Heated debate surrounds the topic of health care in both the US and in Canada. In each country, these debates are based in some measure on perceptions about health care in their neighboring country. The perceptions held by Canadians about the US health care system, or those held by Americans about Canada, end up having significant impact on health policy makers in both countries. Health Care Policy and Opinion in the United States and Canada examines these perceptions and their effects using an extensive cross-national survey made up of two public opinion polls of over 3,500 respondents from the US and Canada. The book first develops a rigorous and detailed explanation of the factors that contribute to levels of satisfaction among Americans and Canadians with respect to their health care systems. It then attempts to study the perceptions of Canadians vis-à-vis the US health care system as well as the perception of Americans toward Canada’s health care system. The authors examine how these perceptions impact health policy makers, and show how the survey results indicate remarkable similarities in the opinions expressed by Americans and Canadians toward the problems in the health care system, heralding perhaps a measure of convergence in the future. 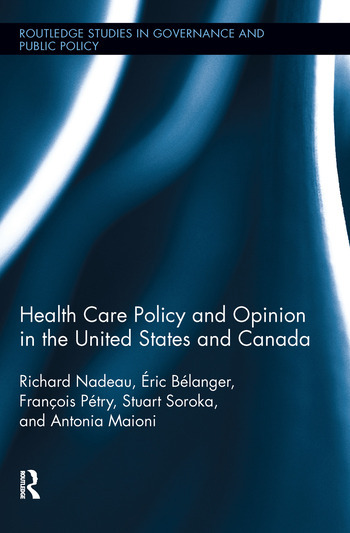 The authors present how perceptions on health care indicate elements of convergence or divergence between the views of Canadians and Americans, and discuss how these citizen opinions should inform health care policy change in both countries in the near future. This book should generate interest in scholars of health care, public opinion, and comparative studies of social policies and public opinion. Richard Nadeau is Professor of Political Science at the University of Montreal. His interests are voting behavior, public opinion, political communication and quantitative methodology. A Fulbright Scholar, Professor Nadeau has authored or co-authored over 120 articles, chapters and books including French Presidential Elections and Le comportement électoral des Québécois (Donald Smiley Award 2010). Éric Bélanger is Associate Professor of Political Science at McGill University. His research interests include political parties, public opinion and voting behavior. His work has been published in several scholarly journals including Comparative Political Studies, Political Research Quarterly, Electoral Studies, and the European Journal of Political Research. He is also the co-author of French Presidential Elections and Le comportement électoral des Québécois. François Pétry is Professor and Chair of Political Science at Laval University. His main areas of interest are public policy, public opinion, comparative politics, and research methodology. He has published widely about the links between government policies and the preferences of citizens, as well as the use of polls in health care policy and election campaigning. Stuart Soroka is Professor of Communication Studies and Faculty Associate at the Center for Political Studies, University of Michigan. His research focuses on political communication, the sources and/or structure of public preferences for policy, and on the relationships between public policy, public opinion, and mass media. He is the author, among other work, of Negativity in Democratic Politics and Agenda-Setting Dynamics in Canada. Antonia Maioni is Professor at McGill University in the Department of Political Science and the Institute for Health and Social Policy. From 2001 to 2011, she served as director of the McGill Institute for the Study of Canada, while also holding the position of William Dawson Scholar. She has published widely in the fields of comparative politics, public policy and health care reform.